Chile powder and lime give an inexpensive cut of meat a lot of flavor. Then, when you spoon up a tangy, colorful pineapple salsa next to these soft tacos, you have a delicious dinner with style and flair. Every part of this meal can be done on the grill, but I've given you a stovetop/oven option as well. You can brown the pineapple slabs on the grill or leave the fruit on the grill until one side of the pineapple is truly black, 4 to 5 minutes. I prefer the charred look and love how it tastes in the salsa, but taste and see what you like. The pineapple needs a few minutes to cool when you take it off the grill, so you might want to grill the fruit first and use the time while it's cooling to cut up the remaining vegetables for the salsa. This recipe makes a lot of salsa, but it's good to have on hand in your fridge for a few days, ready to liven up simple quesadillas. For the marinade: In a small bowl, mix the spices, salt, pepper, lime juice, and oil to make a paste. Place the steak in a shallow dish and rub the paste evenly over both sides. Cover and let marinate for 1 to 4 hours. For the salsa: Light a charcoal grill about 30 minutes before you're ready to cook or preheat a gas grill to medium-high. Slice off the leafy top of the pineapple and just enough of the bottom so the fruit rests flat on a cutting board. Slice off the skin with a sharp knife, cutting from top to bottom and taking off as little of the flesh as possible, rotating the pineapple as you go. Discard the skin. Cut out any "eyes" with a paring knife and discard. Slice the fruit away from the core in 4 or 5 slabs. Place the pineapple slabs on the hot grill and grill until the fruit is just beginning to show some browning, 1 to 2 minutes per side, 4 to 5 minutes per side if you want it charred. Let the pineapple cool for a few minutes, then dice. In a medium bowl, mix the diced pineapple, onion, cilantro, lime juice, vinegar, olive oil, salt, and chile and blend well. To cook the steak: Grill the steak for 5 to 6 minutes on each side, or slightly longer for well-done meat. Remove from the grill and let rest for 10 minutes before slicing. Slice the steak across the grain into 1/2-inch-thick slices and arrange on a serving platter. Place the tortillas and the bowl of salsa on the table and serve family-style. Cat's note: The steak and pineapple can be cooked in an oiled ridged grill pan on top of the stove and the tortillas can be wrapped in foil and heated in a 350°F oven. This looks really good…I would love that for dinner tonight…well maybe sometime this week! Nice post! Have a wonderful weekend! You can never go wrong with a taco. Who doesnt love them? You can add any topping you like, the ideas are endless. What a great recipe. Thanks for sharing with us. Yum! Killer tacos! This is a perfect family dinner! My kids always loved making their own tacosf from the plates of ingredients that I put in the middle of the dining room table! Such a fun family dinner! OMG do these sound outrageous! Just reading the instructions for grilling the pineapple caused me to visualize a gooey caramel glaze on soft charred fruit and start to drool! Well done! I am absolutely going to make this; my carnivorous hubby will love it. Wow. They sound delicious. 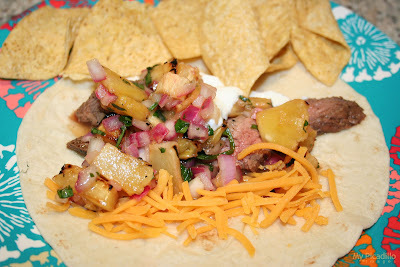 I just made skirt steak fajitas the other day and today I'm making tilapia with a tropical salsa, somewhat like yours. It's soooo tasty! We've missed you. Glad to see you posting again. This certainly looks like something my family would enjoy!!! I am a big fan of Cat Cora as the only female Iron Chef. Love the pineapple salsa in these tacos.